Flora MacDonald Reid (1860-1938). Scottish female artist, sister and pupil of John Robertson Reid. She began exhibiting in Edinburgh at age 16, and exhibited three paintings at the Whitechapel Exhibition of 1902 for artists associated with West Cornwall. Her titles included Charity (for the Sick and Needy) and The Widow. That year, both she and J R Reid lived at Park Hill Rd, Haverstock Hill, London, where they both were actively exhibiting at many shows. She spent many years in France, Norway and Belgium, and lived for 10 years in Looe, Cornwall. Between 1881 and 1932 she exhibited more than 80 pictures at the Royal Academy. 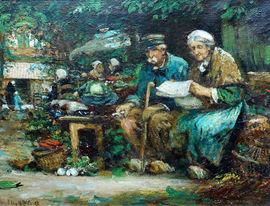 Her works typically depict the daily life of working people, often with a religious touch.